The sacred grove is a pristine tract of forestland that once covered Smiths' 100-acre farm in Manchester Township, New York. It holds a sacred meaning to members of The Church of Jesus Christ of Later Day Saints. Here in the spring of 1820 Joseph Smith, a young 14 year boy, entered this remnant of ancient forest, knelt in prayer, and poured out his heart to God. In response the heavens were opened and God the Father and his Son, Jesus Christ, initiated the restoration to the earth of the fullness of the gospel of Jesus Christ. Visitors who walk along the trails of the sacred grove experience what it must have been like 200 years ago when the young boy Joseph Smith walked through these woods. 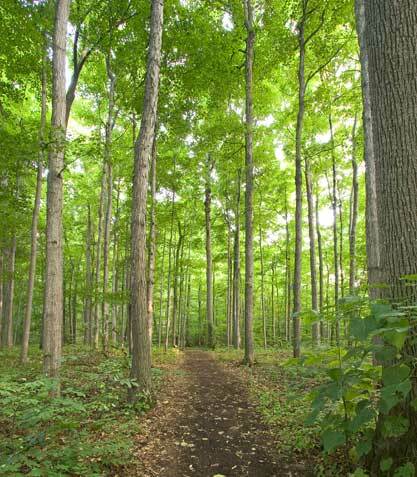 The Sacred Grove is one of the few tracts of pristine forestland that has been left unchanged in upstate New York. Mature trees at the time of Joseph sill grace the forest. The Smith family moved to their 100-acre farm in 1818 or 1819 with the final purchase made by mid-1820. The process of making a farm required the land to be cleared. Several thousand trees were felled some of which were up to four feet in diameter. The wood was used as construction timbers, firewood, fence rails, or burned. Sixty acres were cleared. The Sacred grove was part of a 15-acre sugarbush, located at the west end of the farm, where maple trees were tapped for their syrup. During the 1820s, upstate New York experienced a period of religious revivals. Joseph Smith Jr., a 14-year-old boy, lived in Palmyra, where he attended the services of various religions. He searched the Bible to discover religious truth. While searching the New Testament, he read, "If any of you lack wisdom, let him ask of God, that giveth to all men liberally, and upbraideth not; and it shall be given him" (James 1:5). Joseph was inspired to ask God the questions that had been troubling him. One morning in the spring of 1820, he went to the woods near his home, found a secluded place, and knelt down to pray. While praying, a miraculous event occurred, which Joseph later described: "I saw a pillar of light exactly over my head, above the brightness of the sun, which descended gradually until it fell upon me. . . . When the light rested upon me I saw two Personages, whose brightness and glory defy all description, standing above me in the air. One of them spake unto me, calling me by name and said, pointing to the other–This is My Beloved Son. Hear Him!" (Joseph Smith History 1:16-17). These two personages, God the Father and His Son Jesus Christ, instructed Joseph not to join any of the churches then established, but instead to wait for further direction in the restoration of Christ's Church. Another significant event happened in 1829 within the Sacred Grove. It is described by one of the attractive plaques found along the trail. In late June 1829, Joseph Smith Jr. gathered a small group of his family and friends to a secluded spot in these woods and showed them the gold plates from which the Book of Mormon was translated. He allowed each of the eight participants to hold the ancient record, turn its pages, and examine its characters. 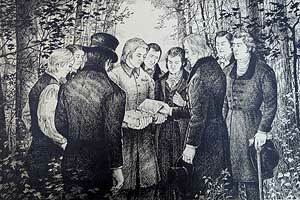 They prepared a written testimony, which was published in the Book of Mormon. Copyright © 2005-2006 Calvin & Rosanna Hamilton. All rights reserved.